Source: TheTruthAboutCancer.com – Most of us know that there are a number of foods which are powerful cancer fighters and immune boosters, such as red beets, cruciferous vegetables, garlic, etc. Likewise, most of us have heard about the value of juicing in both cleansing the body of toxins as well as providing valuable nutrition for a healthy body. 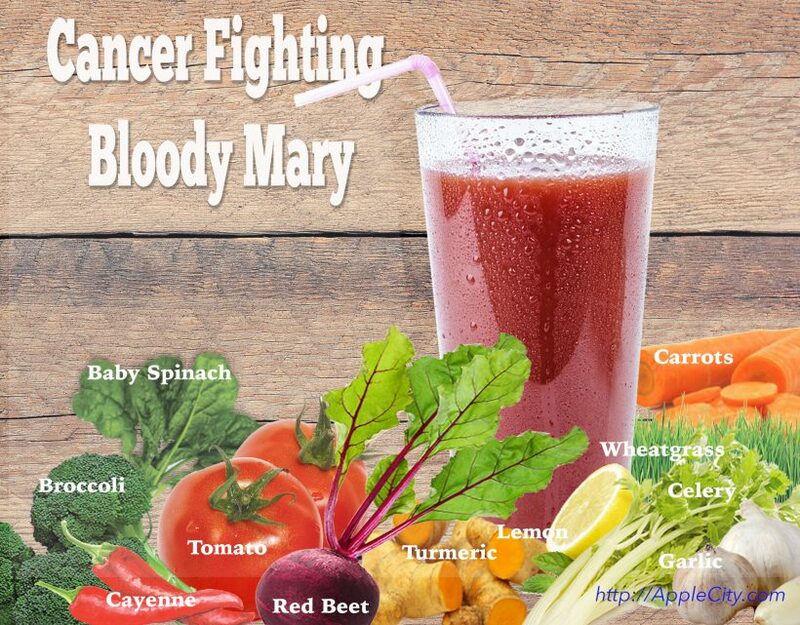 With this “Bloody Mary” recipe, you get the best of both worlds… a potent and tasty juiced drink which contains some of the most potent cancer fighters on the planet. And if you are a fan of Bloody Mary drinks (albeit non-alcoholic), all the better. Red Beets – Beets help protect against cancer, particularly colon cancer. There is also something called “Beet Therapy” which doctors have used to get rid of tumors and to help with blood diseases and leukemia. Beets are also rich in betaine, which stimulates liver cell function and helps keep the bile ducts healthy and flowing so that the body can properly eliminate toxins. Carrots – Carrots and carrot juice have been widely used to successfully beat cancer, sometimes as a standalone treatment. Among the many healthy compounds found in this root vegetable are polyacetylenes, which studies have found to be beneficial against inflammation and cancer. Tomatoes – In addition to providing the tomato juice that gives the characteristic red color to Bloody Mary drinks, tomatoes help guard the DNA in your cells from damage that can lead to cancer. Tomatoes contain a particularly high concentration of the antioxidant called lycopene. Baby Spinach – Spinach is one of the healthiest dark green leafy vegetables. It contains a large number of valuable vitamins, minerals, and phytonutrients. Spinach is especially rich in folic acid. Folic acid helps maintain the cell’s genetic code and regulate normal cell division. Broccoli – Broccoli is a cruciferous vegetable – a group of vegetables that are among the most powerful cancer fighting foods to be found. Cruciferous vegetables are high in fiber, vitamins, minerals, and important antioxidants such as beta carotene and sulforaphane compounds. Cruciferous vegetables contain isothiocyanates. These are phytochemicals which help break down potential carcinogens. They also contain indole-3-carbinol (I3C), which help prevent estrogen-driven cancers. Wheatgrass – Wheatgrass is one of the most potent superfoods on the planet and is used as a primary component of some alternative cancer treatments. Primary among its many cancer-fighting ingredients is chlorophyll, which has almost the same molecular structure as hemoglobin. Chlorophyll also contains the noted cancer-fighters selenium and laetrile. Celery – Celery is a powerfully healthy vegetable that is most noted for helping regulate blood pressure. It is also a powerful cancer fighter and it contains apigenin and luteolin, compounds which are bioactive flavonoids that fight cancer cells. Garlic (2-3 cloves) – Garlic, as well as onions, leeks, and chives, have immune-enhancing allium compounds. These compounds increase immune cell activity, help break down cancer causing substances, and block carcinogens from entering cells. Studies have linked garlic to lowering the risk of stomach and colon cancer. Diallyl sulfide, a compound found in garlic oil, has also been shown to incapacitate carcinogens in the liver. Cayenne (as much as you can comfortably drink) – Hot peppers such as cayenne (chili peppers) and jalapenos contain capsaicin – a chemical which fights cancer and helps neutralize certain cancer-causing nitrosamines. Hot peppers are especially valuable for helping prevent stomach cancers. Whole Lemon – Lemons are widely used in anti-cancer diets and treatments. Studies have found that lemon extract can successfully destroy malignant cells in a wide range of cancers, including breast cancer, colon cancer, and lung cancer. Turmeric Root (or powdered turmeric if you can’t find turmeric root) – Turmeric is a popular kitchen spice whose main ingredient is curcumin. Curcumin has become a rising star against cancer in recent years. Its powers have been detailed in a whopping 8963 studies and papers in PubMed, the U.S. national library of medicine. Tip: Choose organic and fresh, locally grown ingredients as much as possible for the healthiest recipe. Also, wash all fruits and vegetables well before cutting or adding to the recipe. 1. Use a more or less equal amount of the above ingredients, except for perhaps using a few extra tomatoes, using only a few cloves of garlic, and using only as much cayenne pepper as you can tolerate. 2. Juice the above ingredients in a quality low-RPM juicer such as the Omega Vert 350HD used by this author. Note that high RPM juicers oxidize the ingredients and greatly reduce the juice’s health benefits. 3. Add fresh ground black pepper, turmeric powder (if you cannot find turmeric root to juice), and Himalayan salt to taste after making the juice. Then, plop in a celery stalk and perhaps a couple of green olives and enjoy! As a cancer preventive, enjoy a couple of glasses several times a week. As a cancer fighter and detoxer, drink 6 or more tall glasses per day for at least a week with no other food consumed. After that, continue drinking several glasses a day along with a healthy diet and other cancer-fighting supplements thereafter. For a sweeter morning version, substitute apples for the tomatoes and also add ginger. The key to getting the maximum benefit from juiced drinks is to consume them while the plant enzymes are still “live.” Thus it is best to only make as much as you will be able to drink within a couple of days instead of making large batches that may take days to consume. The post A Cancer Fighting “Bloody… appeared first on The Truth About Cancer. Your Cancer Doctor: A White Coat Bully?